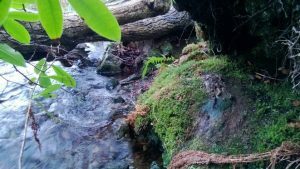 This note by Nigel Burch has been written to inform and educate people as to the signs in the environment, which indicate the presence of otters. 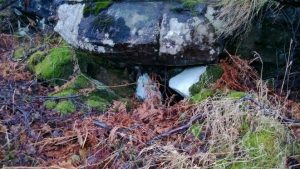 It will hopefully then make people aware if they are in a sensitive location and then be able to give the animals the respect and consideration that they surely deserve. Natal holts, where a female otter gives birth and raises her cubs for the first three months, are normally found in secretive places often a long distance from the sea. 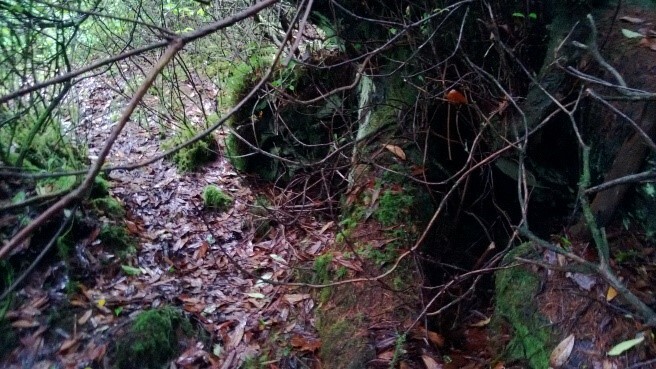 On Mull they are often under rocky mounds, deep in scrubland or woodland. Nursery holts where a female otter brings her cubs from inland to the sea, she will put them in a holt near to the coast. She will bring food to them and take them out foraging and return to lay up. 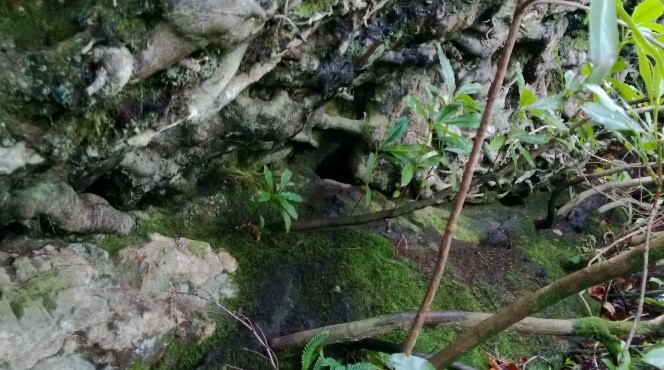 Rocky outcrops are favoured as well as holes under tree roots and even under quiet structures such as sheds. Natal holt. Photo by Nigel Burch. Natal nursery holt. Photo by Nigel Burch. 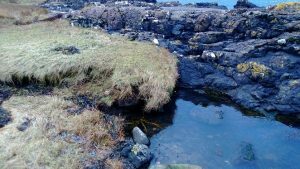 These are lay-up sites where otters rest in shelter out of the weather, between foraging periods or other exploratory outings. They are often found close to the shore or in cover not far inland. Hovers vary in size and type, they could be a dry ledge under a rock, a small cave, a hollow under a fallen tree or roots and can be man-made structures such as ruined boats or buildings. Otters use routes when travelling on land, which can be hundreds of years old. This means that paths can be very distinctive and obvious. 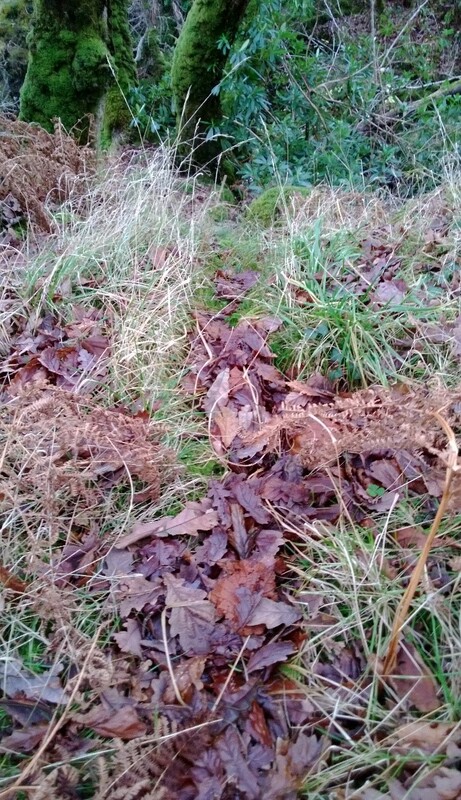 When vegetation dies down in winter and spring, paths become less obvious. Other animals use these paths and otters use other animals’ paths, such as deer and sheep, which can confuse the situation. As well as just going to the loo, otters use their droppings (spraints) to communicate, by scent with other otters. Spraints can be different in size or content. They can be regular black, tarry with many visible fish bones and about 50mm long, to a tiny pellet, about the size of a grain of rice, to a mucus gel. 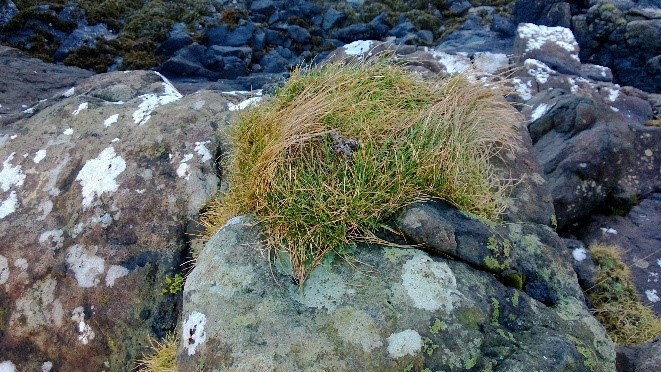 Spraints can be found on tidal rocks and seaweed, to two thirds the way up Ben More. Spraint sites can be many, even hundreds of years old, when they reach a large size and are often bright green from the nutrients in the spraint. They are often associated with other features mentioned in this note. If you find large quantities of spraint consisting of crab shell and therefore brown or orange in colour it often means the presence of young otters in the area. When otters leave the sea, they will often swim through a fresh water pool, burn or river. It is thought that this is to remove salt from their fur. Pools are found near to the shore, they can be fed by small burns or stagnant, rain fed pools. If they become very stagnant and unpleasant, otters will stop using them until they are refreshed. Paths leading to and from the pools, with spraint sites at the entrance and exits are commonly found. This is an area, normally around a metre in diameter, above the high tide mark in grass, bracken, heather or other rough vegetation. Otters like to clean and dry their fur when they leave the sea or fresh water. They do this by rolling, and rubbing their fur on the vegetation. In doing so they wear down a favourite place, scuff it up and generally disturb the vegetation. 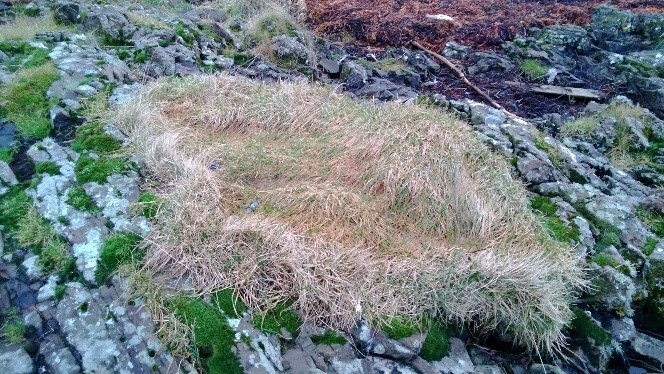 This is a feature, roughly circular or oval in shape, about a metre in diameter, normally of grass, which is formed by an otter resting up in the same grassy place. A hollow is formed and the grass builds up around the edge, over time the whole structure builds up and can become quite high. Vegetation is also dragged in, so increasing its size. These structures are not common. 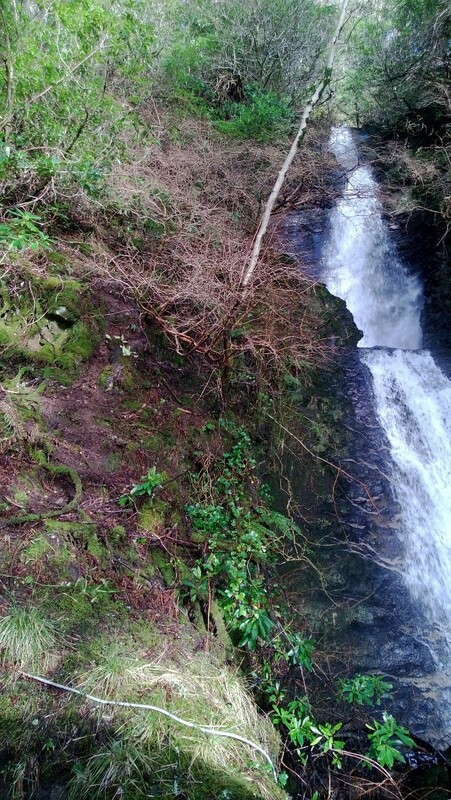 This is where otters tend to come down a steep bank, often grassy, which, when the weather is very wet (not uncommon on Mull), becomes muddy and slippery. Otters then, instead of walking down, slide down on their tummy. The slide becomes muddier and otters use this as a slide until the ground dries out. Slides can also be found in snow conditions. 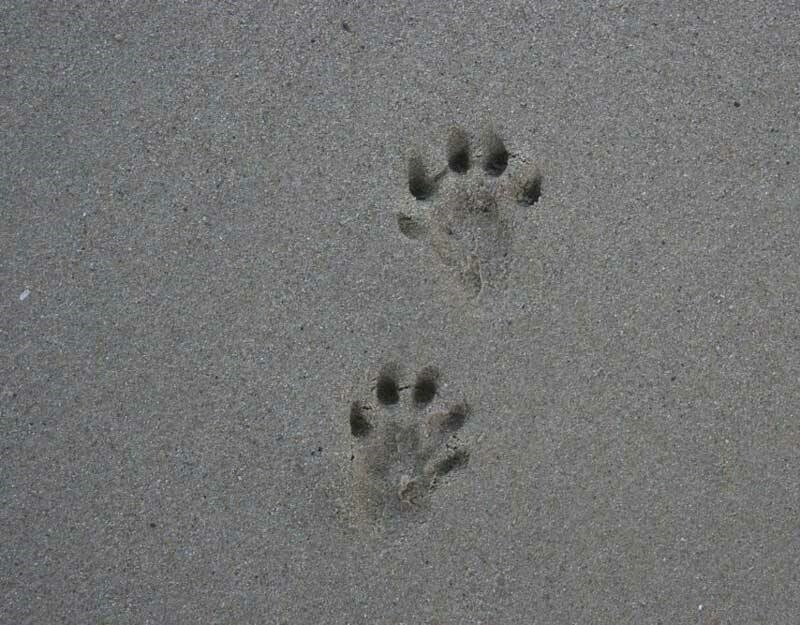 Distinct from other mammals, as the print has five digits. They can be confused with other mustelids, such as mink and pine marten. 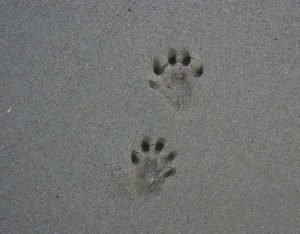 There may also be a groove in the sand or mud, where the otter’s tail touches the ground whilst walking. Otters travelling over ground sometimes leave strands of fur (normally the courser guard hairs) where they go through fences or brambles. The most common calls heard are a high pitched whistle from young otters communicating with their mother, this is very distinct and can be persistent if the cub is separated. Some bird calls such as the rock pipit, sound very similar. When two adult otters meet and are concerned about each other’s presence, or when an otter meets a mink, a loud chittering may be heard. 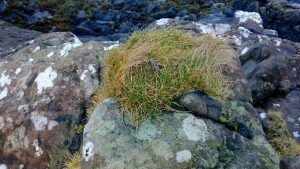 Otters on Mull are normally seen in the sea, or on tidal, weedy rocks. Otters here forage in sea which provides the bulk of their food and are therefore normally found close to the shore. Similar in profile to seals, they can be recognised by looking for three humps –head, back and the give-away tail. Seals normally dive by gliding under in a curved gentle motion, whereas otters often have a more energetic dive, with that tail being very distinctive. Don’t forget to report your otter sightings. Read further advice on responsible otter watching. More information can also be found from The UK Wild Otter Trust. This guide is intended to inform and educate the reader of the signs that may be found in the environment, which indicate the presence of otters. The author does not advocate or encourage anyone to seek out any resting place (especially holts and hovers) as this may cause disturbance. It should be noted that it is a legal offence to deliberately or recklessly disturb or harass an otter, damage, destroy or obstruct access to a breeding site or resting place of an otter. This includes holts and hovers. 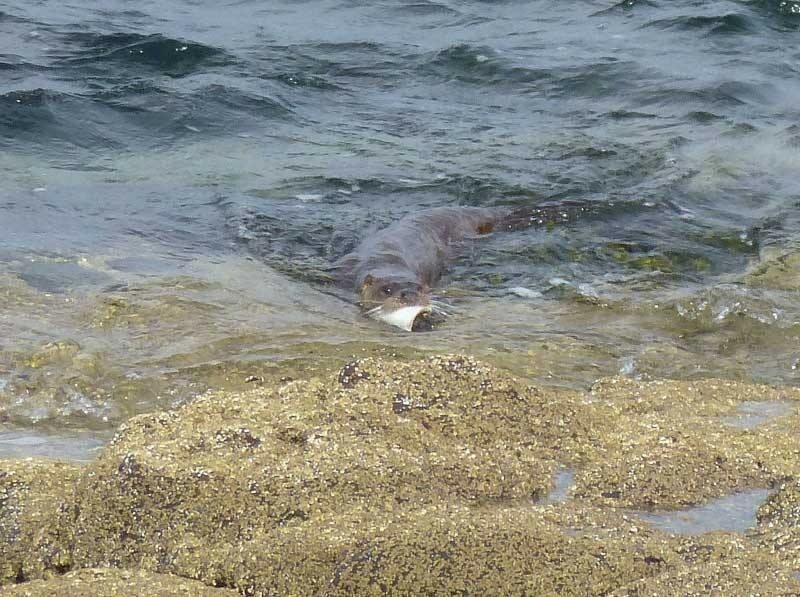 Please enjoy learning more about Mull’s otters and watching then in their natural environment, whilst at the same time giving them the space and respect that they surely deserve.